Our physicians at Springdale-Mason Pediatrics partner with parents to promote the optimal health of their children. All of our physicians have office hours at both of our locations each week. We encourage you to get to know all of our doctors and choose three that you would like to see regularly. This will provide you with greater convenience in scheduling and offer more options if one of our doctors is unavailable when you need them. Click on the doctors’ names below to learn more about their education, their background and interests. Dr. Bawa was born in Columbus, Ohio and received her Bachelor of Science in Psychology from The Ohio State University. She received her degree in medicine from the Johns Hopkins School of Medicine. 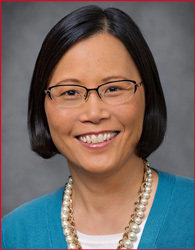 She is a fellow of the American Academy of Pediatrics, is certified by the American Board of Pediatrics and is a member of the Cincinnati Pediatric Society. Dr. Bawa joined Springdale-Mason Pediatrics in June 2002. Prior to joining our practice, Dr. Bawa served as Chief Resident at Children’s Memorial Hospital in Chicago, Illinois and was in private practice in Glenview, Illinois. She is a recipient of the Emanuel O. Doyne Community Teaching Award (Mead-Johnson National Award) for 2014. Dr. Bawa is married and has two children, Rani and Rakhi. Outside of work, she enjoys yoga, college football and photography. As for practicing medicine, Dr. Bawa loves the opportunity to be a part of children’s lives as they grow and develop. She believes that there should be an emphasis on prevention and education at all levels, including education of parents, patients and future physicians. Dr. Paul Bunch was born in Middletown, Ohio, and grew up in Cincinnati. He graduated from the University of Cincinnati School of Medicine and completed his residency at Cincinnati Children’s Hospital Medical Center, where he served as Chief Resident. He is a fellow of the American Academy of Pediatrics and is a member of the Cincinnati Pediatric Society. He is board certified by the American Board of Pediatrics. Dr. Bunch’s special areas of interest include childhood obesity, the use of technology in health care, quality improvement and medical education. He strives to approach pediatrics in an evidence-based and family-centered manner. Outside of work, he enjoys spending time with his wife and five children in addition to traveling, music and history. Dr. Golden is originally from the Windy City of Chicago. She completed an undergraduate degree at Loyola University and obtained her doctor of medicine from Chicago Medical School. She moved to the Dayton area to complete her pediatric residency at Dayton Children’s Hospital. Dr. Golden is board certified by the American Board of Pediatrics and a member of the American Academy of Pediatrics. Dr. Golden is honored to have been awarded the Gold Humanism award and been inducted into the AOA in recognition of her enthusiastic and compassionate patient care and teamwork. She enjoys seeing patients of all ages and has a background in acute care with emergency medicine experience. Dr. Golden lives in the Cincinnati area with her husband. When she isn’t working she enjoys hiking, traveling and trying new restaurants. Dr. Holubeck is a native of Honolulu, Hawaii. She received her Bachelor of Science with Honors from the University of California, Berkeley, in 1986, and graduated from the University of Hawaii John A. Burns School of Medicine in 1990. She completed her pediatric residency at Children’s Hospital of Los Angeles in 1993. She is board certified and is a fellow of the American Academy of Pediatrics. Dr. Holubeck has been with Springdale-Mason Pediatrics since 2005. Her previous work includes positions in private and public health practices in Los Angeles from 1990 to 1996 and working in private practice in Cincinnati from 1996 to present. Dr. Holubeck is married and has two children. Outside of work, she enjoys running, hiking, camping, travel and music, as well as singing and playing guitar in her church choir. Dr. Kellogg was born in Clovis, New Mexico and grew up in Avon Lake, Ohio. She earned her B.S. from Xavier University in Cincinnati, then earned her medical degree at the West Virginia University School of Medicine. She received her residency training at Cincinnati Children’s Hospital. Dr. Kellogg joined Springdale-Mason Pediatrics in July 1999. She is a fellow of the American Academy of Pediatrics and the Cincinnati Pediatric Society and is certified by the American Board of Pediatrics. She believes that being a good pediatrician involves getting to know the whole family well—it’s not just about prescribing medications. In her free time, Dr. Kellogg enjoys hobbies such as sewing, knitting and crocheting, and also likes to snow ski and cook. She is the mother of two teenage children, a boy and a girl. She’s had a lifelong love of Girl Scouts and is now a leader for her daughter’s troop. Dr. Leanza is a Cleveland native who spent most of his childhood in California and rural mid-eastern Ohio. He received a B.S. in Biology from the University of Cincinnati, his Masters in Health Science (Public Health) from Johns Hopkins and his M.D. from the Medical College of Ohio in 1999. He completed his Pediatric Residency at EVMS/Children’s Hospital of The King’s Daughters in Norfolk, Virginia in 2002. Dr. Leanza joined Springdale-Mason Pediatrics in July 2002. His areas of specialty include childhood development and parenting, medical informatics and evidence-based medicine, behavioral and academic disorders, asthma, health and prevention of disease, and teaching pediatrics. He is board certified and is a member of the American Academy of Pediatrics, the Cincinnati Pediatric Society and the Ambulatory Pediatric Association. As a physician, he describes himself as a relative minimalist who is interested in healing and preventive medicine. He is focused on child/parent development and guidance, and provides evidence-based and teaching-oriented care. Dr. Leanza and his wife have four children. The family enjoys soccer and other sports, music and is involved in their community and schools. Dr. Lichtenstein is a Cincinnati native. After graduating from The Seven Hills School, she moved to St. Louis to attend Washington University, where she studied Psychology and Anthropology. She soon changed gears and decided to pursue medicine, earning her medical degree from Temple University. After a decade away from home, she returned to Cincinnati for residency, which she completed at Cincinnati Children’s Hospital. While there, she participated in the primary care track focusing on general pediatrics. Dr. Lichtenstein is board certified by the American Board of Pediatrics and a member of the American Academy of Pediatrics and the Cincinnati Pediatric Society. She enjoys seeing patients of all ages and has a special interest in preventive medicine and instilling early interest in one’s own health. Dr. Lichtenstein lives in Hyde Park with her husband and their two dogs. Outside of work, she enjoys reading, attending Reds games, traveling, and frequenting Cincinnati’s many dog parks. Dr. Sekar has practiced at Springdale-Mason Pediatrics since 1991. She earned her Medical Doctorate degree at Chennai Medical College in Chennai, India. Upon graduation she served as a Research Associate at Medical College of Virginia in Richmond, Virginia for three years. She completed her residency at Children’s Hospital of King’s Daughters in Norfolk, Virginia. Dr. Sekar is certified by the American Board of Pediatrics, a fellow of the American Academy of Pediatrics and a member of the Cincinnati Pediatric Society. She is a recipient of the Emanuel O. Doyne Community Teaching Award (Mead-Johnson National Award). In addition to general pediatrics, she is interested in infectious diseases and dermatology. She published research in three scientific publications while at the Medical College of Virginia. Outside of work, Dr. Sekar enjoys computers and technology, as well as Bollywood music, which she sometimes DJ’s on special occasions. She is married and has a son. When it comes to her philosophy on pediatrics, Dr. Sekar believes it is important to listen carefully to both parents and patients and provide good, compassionate medical care. Her approach is to support parents in all aspects of their child’s physical development and emotional well-being so that each child may reach his or her highest potential. Dr. Singerman, who worked at Springdale -Mason Pediatrics since 1997, passed away after a brief illness in 2017. He previously worked at Pediatric Associates of Fairfield, Pediatric Consultants and Neonatology Care Associates. His stalwart and caring presence continually inspired all of us in the Springdale Mason Pediatrics family and beyond. He had such great compassion and care for his patients, and he always kept us laughing with his trademark sense of humor.